The average American teenager has a busy life. Most teens get up early for a full day of classes at school. The teenage schedule is also often packed with studying, part-time work, and extracurricular activities like sports teams or other organized clubs. 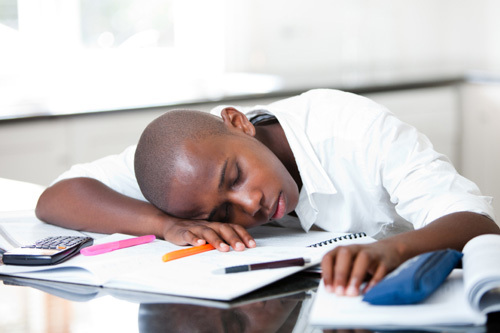 It’s no wonder that many of these students are exhausted, according to a new study published in the February edition of the journal Pediatrics. Researchers from the University of Bristol in the U.K. found that about one in 50 16-year-olds have chronic fatigue lasting a minimum of six months. That is about two percent of all 16-year-olds. The study is considered the largest to date on chronic fatigue syndrome (CFS) in children. The students with CFS missed an average of half a school day each week. Besides fatigue, other symptoms of CFS include headaches, sleep problems, low-grade fever, weakness, depression and anxiety, temporary memory loss, concentration difficulties, joint and muscle pain, weakness, appetite loss, sore throats, intestinal problems, upper respiratory tract infections, and exhaustion even after mild exercise. People who are generally considered to have this syndrome experience at least four of these symptoms for a six-month period. For the study, a CFS diagnosis was considered having chronic fatigue for three months or longer. Approximately three percent of all 16-year-olds studied had CFS based on study criteria. Needless to say, CFS—also known as myalgic encephalomyelitis (ME)—can be a nightmare for busy high school students. CFS is thought to affect about 11.5% of Americans and a total of 1 million people, according to the Centers for Disease Control and Prevention (CDC). Based on this recent study’s criteria, CFS affects 15% of the population. For the study, the research team examined CFS in 5,756 children who were part of the Avon Longitudinal Study of Parents and Children (ALSPAC)—also called “Children of the 90s.” The study continues to track the health of 14,000 mothers, their partners, and their children from 1991 and 1992. The researchers found that girls between 13 and 16 were more likely to have CFS than boys. The children that came from greater adversity were also more likely to get CFS. Adversity factors included lack of emotional support from mothers, poor housing, and financial difficulties. It is important to note that the CFS was not doctor-diagnosed; however, it was based on questionnaire responses from teenagers and their parents. Diagnosing CFS is considered challenging, and there is currently no lab test to diagnose the condition. The most common treatments for CFS include antidepressants, sleeping pills, exercise, and psychological counseling. Proper posture, and breathing and body exercise can also help CFS. What are natural ways to treat CFS? Supplements shown to increase energy include D-ribose, ashwagandha, L-carnitine, and Rhodiola rosea. Other natural remedies used for CFS include coenzyme Q10 (CoQ10), nicotinamide adenine dinucleotide (NADH), magnesium, Siberian ginseng, Panax ginseng, probiotics, vitamin C, 5-hydroxytryptophan (5-HTP), oil of oregano, vitamin D, licorice root, Cordyceps sinensis, Reishi, ginkgo biloba, as well as vitamin B12 and other B vitamins. “1 in 50 16-year-olds affected by chronic fatigue syndrome,” University of Bristol, January 25, 2016; http://www.bristol.ac.uk/news/2016/january/chronic-fatigue-syndrome.html. “Chronic Fatigue Syndrome (CFS),” Centers for Disease Control and Prevention web site, last updated May 14, 2012; http://www.cdc.gov/cfs/general/index.html, last accessed January 26, 2016.